The coarse cephalic and thoracic rugae have interspaces which are strongly shining and faintly or not at all punctuate. The body is a concolorous light ferruginous red. The sides of the propodeum are smooth and shining and there are no propodeal spines, teeth or denticles present. This species is found nesting in open, warm, sandy areas. The nest entrance is often irregular and surrounded by a circular or semicircular crater of loose sand. Foragers are day active and forage individually or in columns. Prey includes arthropods and many types of seeds. Colony size can be up to several hundred individuals and reproductives are present in the nest during July. Mexico and United States. Western Texas, southern New Mexico, southern Utah, Arizona, Nevada and southern California, Mexico - Baja California and Sonora, Chihuahua. 8 km W. Aneth, Utah in sandy wash, widespread along the sandy banks of the Little Colorado River and along the south rim of the Grand Canyon above Lee’s Ferry, Arizona. The genus Pogonomyrmex is the preeminent group of harvesting ants in North America, where it nearly blankets the arid regions of Mexico and the western United States. As is true of other harvesting ants, the workers of this genus collect seeds for food, "harvesting" the plants in their nesting areas by snipping off the seeds with their mandibles. Husked within the nest and stored in subterranean or mound chambers, these highly nutritious seeds become the paramount food for the society, sustaining the ants even through the winter. Seeds are not their sole food, however, because the ants are scavengers as well as harvesters. Although their victims are chiefly arthropods, the workers may transport a varied array of dead booty to their nests. The nests themselves are constructed in the soil, generally in areas fully exposed to the sun. Some are beneath stones, whereas others are surmounted by soil craters or by small to huge mounds with or without coverings of gravel. In addition, the workers of some species alter the area peripheral to the nests by clearing away the plants, felling them, bit by bit, with their powerful mandibles. Such mounds their surrounding denuded area, characteristic of the western harvester, are familiar sights to travelers in the arid West. 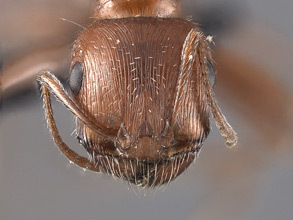 Although the workers of some species of Pogonomyrmex are extremely hostile and will vigorously attack and sting an invader, other species are contrastingly inoffensive and retiring. This species exhibits population specific variability in colony queen number (Johnson 2002, Rissing et al. 2000). The majority of populations are comprised of colonies that were started by, and will only ever consist of, one queen. Foundresses are also obligate foragers, meaning they must leave the nest to forage during the initial stage of establishing a colony. One population is also known to contain multiple queens (polygyny) and these nests appear to be started by a cooperative group of founding queens (pleometrosis). The multiple queen population of this species is striking in a exhibiting a number of unusual characteristics. First, most ant species that contain multiple queens arrive at this route through colony founding by a single queen (haplometrosis). It is only after a colony is well established that secondary queens are allowed to enter the nest. Adding additional queens (queen adoption) to form multiple queen colony may also occur in Pogonomyrmex californicus but it is not the only path open to forming polygynous colonies. Once a colony reaches a late stage in its founding process the mulitple queens that are part of a pleometrotic founded colony typically do not persist. The queens will fight among themselves for control of the nest, or the workers will begin to kill individual queens, or both of these behaviors occur. The result, regardless of the path to this end, is a single queen gaining exclusive control over egg laying within the colony. "P. californicus is a rapidly moving and mostly solitary forager, making extensive use of thermal refuges such as small sticks or stones that allow it to enter a cooler layer of air and dump heat (Lighton and Turner 2004)." Their average foraging distance is from 3 to 5 m from the nest (Bailey and Polis 1987, De Vita 1979). Ants are central place foragers and should putatively optimize their foraging behavior according to predictions of well developed ecological theory. The best use of the foragers time is to optimize the time spent collecting food in a way that maximizes energetic returns. 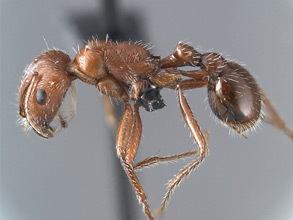 A manipulative experiment (Bailey and Polis 1987) with different sizes of grain has shown that Pogonomyrmex californicus are efficient foragers. They are attentive to trying to collect the most profitable seeds, in terms of seed size and the time spent foraging. Territories are well defined in populations where nests density is high (De Vita 1979 and others). Intraspecific interactions can occur frequently between neighboring colonies, nests may be overdispered, and colony relocations more often then not move their nests further away from the nest of a neighbor. The physiology of Pogonomyrmex californicus has been studied in some detail (e.g., Quinlan and Lighton 1999, Lighton and Turner 2004). From this we have descriptive details about this ant's respiration and the maximum temperatures they can tolerate (CTmax = 51 C or 124 F). This high heat tolerance of Pogonomyrmex californicus is coupled with a relatively small body size relative to most other Pogonomyrmex species. 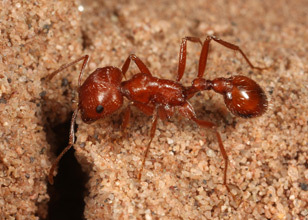 Being small apparently helps workers to shed heat more rapidly, when heat stressed, in comparison the to the larger bodied Pogonomyrmex rugosus. 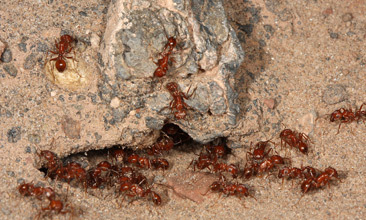 These temperature tolerances and abilities are important as the ground layer where these ants forage can be well over 50 C during midday on a hot, sunny day. Geographic. Species described from types collected in California. Original Combination - Myrmica californica - Buckley (1867). As stated in Cole (1968). Bailey, K. H. and G. A. Polis. 1987. Optimal and central-place foraging theory applied to a desert harvester ant, Pogonomyrmex californicus. Oecologia (Berlin). 72:440-448. Buckley, S. B. 1867. Descriptions of new species of North American Formicidae. Proceedings of the Entomological Society of Philadelphia. 6:335-350. Cole, A. C., Jr. 1968. Pogonomyrmex harvester ants. A study of the genus in North America. University of Tennessee Press, Knoxville, Tenn.
De Vita, J. 1979. Mechanisms of interference and foraging among colonies of the harvester ant Pogonomyrmex californicus in the Mojave Desert. Ecology. 60:729-737. Johnson, R. A. 2002. Semi-claustral colony founding in the seed-harvester ant Pogonomyrmex californicus: a comparative analysis of colony founding strategies. Oecologia. 132:60-67. Lighton, J. R. B. and R. J. Turner. 2004. Thermolimit respirometry: an objective assessment of critical thermal maxima in two sympatric desert harvester ants, Pogonomyrmex rugosus and P. californicus. Journal of Experimental Biology (Cambridge). 207:1903-1913. Quinlan, M. C. and J. R. B. Lighton. 1999. Respiratory physiology and water relations of three species of Pogonomyrmex harvester ants (Hymenoptera: Formicidae). Physiological Entomology. 24:293-302. Rissing, S. W., R. A. Johnson, and J. W. Martin. 2000. Colony founding behavior of some desert ants: geographic variation in metrosis. Psyche. 103:95-101. A note about these publications. The literature cited here is not meant to be an exhaustive list of papers published about this species.